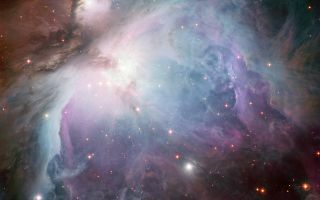 This image of the Orion Nebula was captured using the Wide Field Imager camera on the MPG/ESO 2.2-metre telescope at the La Silla Observatory, Chile. This image is a composite of several exposures taken through a total of five different filters. Light that passed through a red filter, as well as light from a filter that shows the glowing hydrogen gas, is coloured red. Light in the yellow–green part of the spectrum is coloured green, blue light is coloured blue and light that passed through an ultraviolet filter has been coloured purple. The exposure times were about 52 minutes through each filter. In this space wallpaper, the Orion Nebula was captured using the Wide Field Imager camera on the MPG/ESO 2.2-metre telescope at the La Silla Observatory, Chile. This image is a composite of several exposures taken through a total of five different filters. Light that passed through a red filter, as well as light from a filter that shows the glowing hydrogen gas, is coloured red. Light in the yellow–green part of the spectrum is coloured green, blue light is coloured blue and light that passed through an ultraviolet filter has been coloured purple. The exposure times were about 52 minutes through each filter.